Happy October! in Ballymena we have enjoyed a mild september but with the October chill just round the corner its time to dig out our warmer clothes. Tartan is the perfect print to invest in this october as it can brighten up you existing wardrobe, keep you warm and trendy all at once. 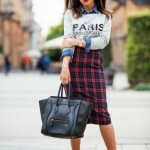 There are a few different ways to embrace the tartan trend this Autumn. Here are a few of our favourite street stylers wearing fashion their way. To avoid looking like you have just left your bagpipes at home add a small dash of tartan to your outfit with a tartan handbag, or a cosy tartan scarf. Take it a bit father with a tartan kilt which you can team with your black chinky knit jumper, or for something a bit more dressy pick up a tartan pencil skirt – be sure to get the hem to hit your knee or below to keep it fresh. Finally, if you are brave enough, take the plunge and go the whole hog with a tartan suit. The key to this is to make sure you pick a slim fit suit and if you are a little wary opt for a darker tartan rather than a bright red. Tartan is something which will always perk up your wardrobe.We have seen some great tartan clothes across the high street from New Look to Peacocks and in Benetton and independent retailers like Couples and Dragonfly. 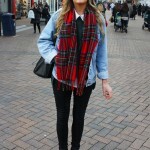 Hit the streets in Ballymena and hunt down your perfect Autumn tartan piece.